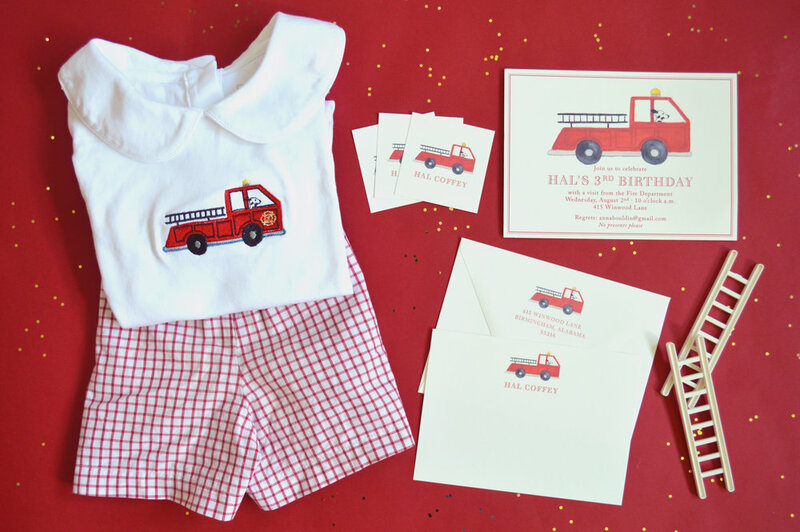 Hal's 3rd Birthday — Calabash Card Co.
Our oldest boy is 3! We had a great time celebrating with our friends and local fire department. I've had several people ask me how we got a fire truck to come to our house and I want everyone to know that they offer it as a service! The fire fighters love seeing the kids and enjoy educating the public. The little ones loved climbing onto the truck and seeing a fire fighter put on his gear. Big thank you to the Vestavia Hills Fire Department! We are thankful for your service! I made a (very homemade looking!) cake in the shape of a fire truck and Hal loved it so much that it made the late night very worth it! Mom made me number cakes for some of my birthdays growing up and they are so memorable that I am carrying on the tradition. Shape cakes are easier than you think. I made the cake in large jelly roll pans then cut out and pieced together the shape. Once the icing's on top you would never know! Thank you to Hartzog Embroidery for stitching out our shirt and bubble!